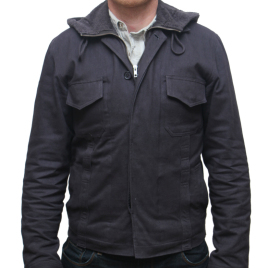 As far as I know, the first authentic replica of the long sold-out CP company M229 jacket. A modified M229 was used in production of "24", season 5, the only modification being that handwarmer pockets were added. I own the fully lined version which is a durable jacket for use in cold weather. The outer material looks tough while the inner lining could also be part of a more business-like coat. There are two inside pockets, one zipped, and two outside handwarmer pockets. The hardest thing about this replica was to get the colour right, and Magnoli Clothiers have done an excellent job on that as well. In bright light, my replica looks brown, while in dim light, it appears gray. This is just the effect that the jacket that was used in the series produced, thereby confusing a lot of people about the "real" colour. I will wear this beautiful jacket a lot - the fit, taken from a well-fitting leather jacket that I own, is just perfect. I can only recommend this jacket - not only to fans of the series, but to everyone else who likes this kind of style!